Herschell Gordon Lewis’ strategy obviously worked, because Bronkowski’s press clippings prove that Blood Feast had a lengthy run on the drive-in and grindhouse circuit throughout the 1960s and 1970s, by which time such Lewis devotees as Tobe Hooper and John Waters had started making films of their own. 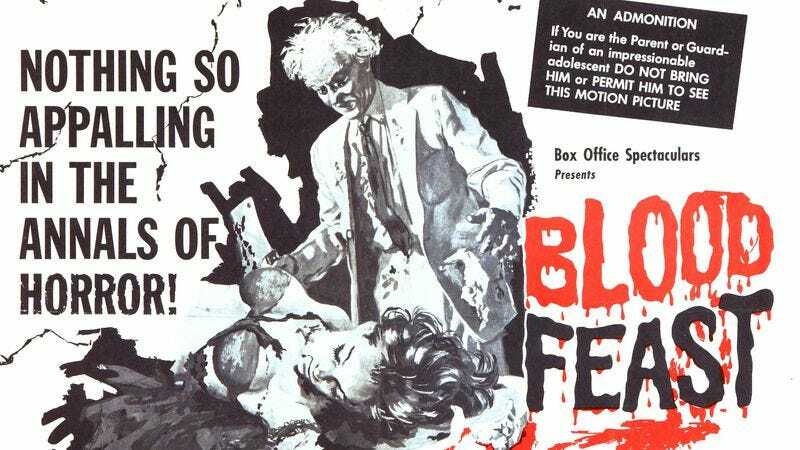 Most of all, the Blood Feast ads shine a light on a now-lost era of movie exhibition, a time when horror hosts like New York’s Baron Daemon might show up to personally introduce a horror film and when audiences had the patience for herculean triple and quadruple features. One ad from the late 1970s, for instance, touts a marathon of Grease, Pretty Baby, and American Hot Wax. This was the world before Netflix.